The role of business - FUTURE-PROOFInc. Dr. Karl-Henrik Robert, founder of The Natural Step and the Framework for Strategic Sustainable Development. 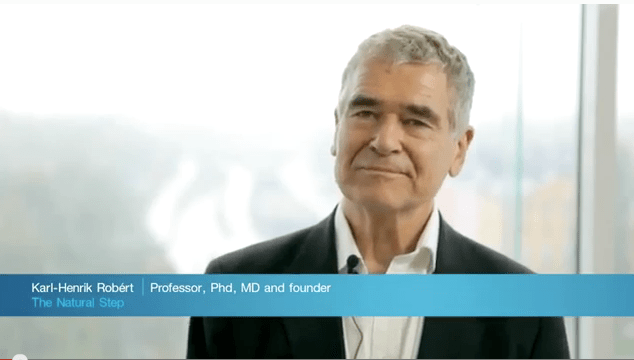 In this video Dr. Karl-Henrik Robèrt, cancer specialist, founder of The Natural Step and initiator of the Framework for Strategic Sustainable Development, touches upon the challenges we as humanity face today and the role businesses can play. To enable seeing the big picture of the sustainability challenge and turning this into opportunities. He gives examples and methods of how this journey is possible and encourages all to start designing the future by identifying boundary conditions for a sustainable future.